Discussion in 'Cellaring / Aging Beer' started by bl00, Feb 1, 2019. 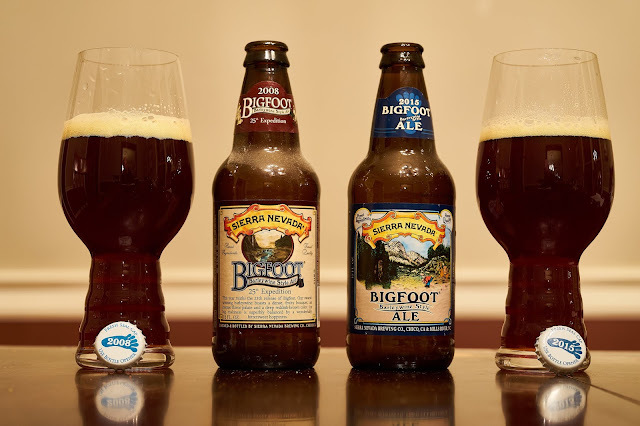 Bigfoot has become one of the most popular beers to age and discuss in this section of the forum. This thread can serve as a starting point for anyone who would like to share their observations in cellaring Bigfoot. Several of us have planned to age a 6pack of 2019 Bigfeet and participate in group reviews at different intervals of aging as well. To begin, would anyone be interested in a group review of a prior year's vintage? I have 2014 and 2017 on hand. TheGent, BeastOfTheNortheast, AirBob and 4 others like this. Please feel free to tag any others who might be interested in joining! ManBearPat, DIM and Beersnake1 like this. Excellent! I’m in - need a sixer. Also have a 2010 Bigfoot. BeastOfTheNortheast, bl00 and DIM like this. Nice! I have a 14 that I could crack any time. the_ceeeeg, BeastOfTheNortheast and bl00 like this. Glad to see this up and running, thanks @bl00 ! I'm having a dry February (cuz it's the shortest month) but I'll follow along and my first beer in March will be a Bigfoot of one vintage or another. It was 2008 that SN switched away from twist off caps, so I think these will now have even better aging potential. A decade is the longest I've gone so far. I have a 4 pack of 2-2013's and to 2-2015's tucked away to share with my boys when they are older, since those are the years they were born. BeastOfTheNortheast, ManBearPat, bl00 and 1 other person like this. I picked up a six of it a year ago. Iirc Patrick Dawson said that the ideal time for this is 3-5 years so I'd be willing to try one of my 2018s later this month or March and then fill in subsequently as time goes on. Ftr I think this is a great idea and major props to @bl00 for initiating it. BeastOfTheNortheast and bl00 like this. Starting with a relatively fresh 2019 Bigfoot. Pours a nice semi-transparent reddish brown. Nose is candy, toffee, a touch of grapefruit peel, and a bit of pine. Taste is awesome. A bit less hoppy than I remember from fresh Bigfoot. Definitely a mixture of bitter hops and sweet candy. Resin, grapefruit, tree sap, horse blanket, toffee, and a touch of wheat. Mouthfeel is fairly dry and light. I look forward to trying this next to an older vintage. BalancingBrooms, BeastOfTheNortheast, DIM and 2 others like this. Hope it's not a bother to indulge myself here. Two years ago, during Sacramento Beer Week, SN ran a 5-year BFBW vertical at a beer-friendly pizza joint. I took 3 friends and bought two verticals. While they were very enjoyable, there was not much difference going up and down. The newer ones were brighter and hoppier, the older ones were more carmelly and malty. But they had evolved less than a standard ageworthy red wine. Not knocking anyone who wants to pursue this, just my thoughts about this one instance. DIM and bl00 like this. Decades ago I used to cellar Bigfoot - not really because I wanted to, but because in Pennsylvania if you wanted to buy beer (other than draft or take out from a bar/restaurant) you had to buy a whole case. There were several beers that I'd buy every year, and after the first 6-pack they'd just be waiting in the cellar until you got around to them. I can't recall any specific vintages (this would have been in the 90's), but in general I preferred it with a year or two on it which softened the bitterness. The loss of aroma was a trade-off that I could live with. Beyond that I didn't find much variation until about 5 or 6 years, which were still not bad, they just lost a little life. I had some older vintages that I received from other people which would have been 10 to 12 years old and I didn't think that they were that good. I should also note that there were variations from year to year, and side by side, one year apart versus another would occasionally show up better or worse but I blame that on production, not aging. Keep in mind, that was decades ago and what's coming out of Sierra Nevada now must be much more focused and quality assured. With that said, I'm very curious to see what people think now. Back then my sweet spot would have been 3 to 6 years, with 8 or more years not quite pleasing me. BeastOfTheNortheast, DIM, CaptainHate and 1 other person like this. This sounds interesting. I've got yearly vintages dating back to '09. Haven't seen this year's vintage yet. Bitterbill and bl00 like this. I am trying to stick to a new program of one dry week a month, this one will be ending on the 8th so I will try to get a fresh one to review then. Are folks interested in revisiting it every 6 months? Every 8 or 9? Just once a year? BeastOfTheNortheast, bl00 and toolbrew like this. I think the consensus is that we are open to experimentation. Both 6 month and yearly intervals have been discussed. Poured into a large goblet produced a smaller than expected, much smaller than @Beersnake1's photo, head over a clear dark brown amber body. Smell is of piney citrusy toffee. Taste was surprisingly not the hop monster I was expecting; don't get me wrong, there was plenty of bitterness but already complex dark sweet flavors underneath with very little overt alcohol. Mouthfeel was particularly bitter on the back end. BeastOfTheNortheast, DIM and bl00 like this. No 19 in Casper either but that's not unusual. Got a couple 6ers on Friday and cracked my first 2019! Pretty tasty, rather bitter... still pretty good, but I think patience pays off with this one for me personally. BeastOfTheNortheast, CaptainHate, Bitterbill and 2 others like this. A buddy of mine scored a 2008 bottle from Bottle Logic in Seattle this past August, and he was generous enough to share it with me. Not having optimal cellaring conditions, I usually don't age anything beyond about 6 or 7 years, so I was really curious to see how a brew would hold up over that length of time and under professional aging conditions. Let's just say it did not disappoint. It was surprising still very hop-heavy, even after nearly 11 years. My tasting notes reflect that it led with an abundance of floral hops, followed by orangey citrus and caramel, and with a pleasantly bitter finish. I gave it a very high rating on another site and recall thoroughly enjoying it. Needless to say, this beer does well with some time. I've had Bigfoot fresh, and I honestly don't care for it that way. Based on my experimenting starting with the 2014 vintage, I don't think it really comes out of its shell until about the 4-year mark. Hamilax, BeastOfTheNortheast, Eddiehop and 4 others like this. DIM, BeastOfTheNortheast, CaptainHate and 2 others like this. Have one bottle each of 2017 and 2018 and plan to pick up a couple 6 packs of 2019 to age. Might crack open the 2017 this weekend. DIM, ManBearPat and bl00 like this. 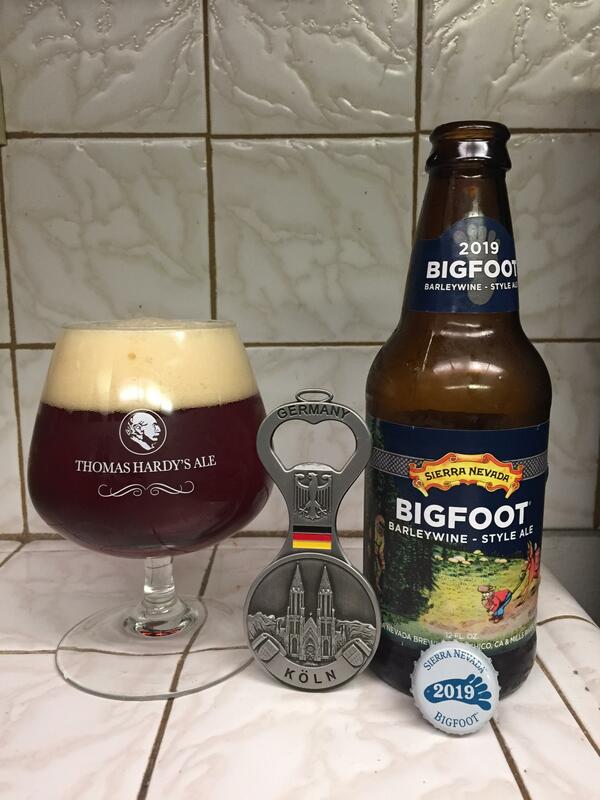 2019 Bigfoot bottled 11/19/18. Poured into a snifter with some head; residual lacing. A lot of hop aroma without much malt. Taste is mainly hops with sweet malt backbone. Overall it tastes like an older double IPA - as if I drank hopslam after four or five months. Strong bitter finish. Will crack the next one in six months...for science. CaptainHate, DIM, BeastOfTheNortheast and 1 other person like this. Have a 2006 to present vertical...will have to start randomly popping the oldest bottles for science. It's always a favorite of mine though! Jacobier10, CaptainHate, DIM and 2 others like this. SFACRKnight and bl00 like this. L: amazing ruby/copper color, really bright, really nice head with great structure. T: black tea and lemon/lime peel, some caramel, some tart apple, surprisingly dry. My thoughts are generally 'lets call this an imperial english IPA'. O: A beer that is not unpleasant to me, but not what I'm looking for if I think to myself 'I really want a barleywine'. I gave it a rating around 3.75, about 10% below it's average. CaptainHate, toolbrew, SFACRKnight and 3 others like this. I probably have one bottle of 08 left and a couple of each year between 09 and now in the basement. I have opened as many as 6 different vintages in one night (sharing with a friend) and I have come to the conclusion that comparing one year to the next (say 13 to 14) is basically pointless, they are just too similar. If you have some "wide spaced" vintages (4-6 years) then things start to get more interesting. ericwo, DIM, BeastOfTheNortheast and 2 others like this. ManBearPat and bl00 like this. SFACRKnight and ManBearPat like this. bl00, BeastOfTheNortheast and ManBearPat like this. I only have 16 - 19 and I don't know if the remaining 8 bottles of 16 are going to survive the year. The longest I ever had one survive is 5 years. After reading the ages of some in this thread I might have to hide some from myself! DIM and BeastOfTheNortheast like this. SFACRKnight and coquet like this. Right? It makes me want to just get a case to store away and have a couple each year. Same with Mad Elf. I think that's also a much better beer with age. When that comes out in the Fall, I'm planning on getting a case and storing most away in the cellar. bl00 and toolbrew like this. Yep, after posting my thoughts above, I ran out to score some '19, several bottles of which now sleep soundly in my cellar. This site is a deliciously bad influence on me. kennyo, SFACRKnight, bl00 and 2 others like this. Ya, this thread is bad news. A local shop has a case for $55 after tax. May be worth it. ericwo, SFACRKnight and ManBearPat like this. Bought a '19 bottle last night to decide if I want to buy a 6er/case. Also, I agree with y'all that it's generally more of an IPA than a barleywine, even by American barleywine standards. I'm brewing my own SN clone for a bourbon barrel (will be second use for beer, so hopefully more oak than whiskey), and I'm going to use Maris Otter and MO crystal instead of 2-row and American crystal to try to give it a bit more malt to counterbalance the hops. Gonna call it Britfoot. Here's hoping it works out. SFACRKnight, CaptainHate, stevepat and 3 others like this. Just picked up a six pack this week. Fresh this has a lot of citrus on the nose. The taste has a good mix of floral and citrus hops up front with a bitter finish. There's malt in there also, but less than I remember from aged versions. Hamilax, ericwo, jmdrpi and 5 others like this. Ok, I'm very into this 2019 Bigfoot. I’m totally down for this. Will give me the excuse I need to open the couple bottles I have left. One each of 14 and 15. Also have one Barrel Aged Bigfoot left from 2015. Would do both 15’s side by side. I haven't had a fresh Bigfoot in a few years. It's always a disappointment after having it aged a few years. If I find some singles, I'll buy one for this thread. If a sixer is all I can get, I age them all. A: They both look very similar in the glass, surprisingly the 2008’s head lingers a bit more. Both are dark ruby color, crystal clear and light tan head. The 2008 might be a tiny bit darker, but that could be my imagination. S: When I poured the 2008, I got a blast of caramel and fruitiness like dark cherry or prune. Nothing obvious as I poured the 2015. In the glass, the hops are more apparent, but not in a “this is centennial or cascade or …” just a definite hoppiness. T: Very bitter, lots of hops but not obvious west coast Sierra Nevada hops, lots of caramel malts, makes me thing dark British caramel vs something basic like C40, light toffee, hint of sweetness. The 2008 gives me hints of chocolate, but probably more me thinking Heath Bar (toffee covered in chocolate). M: Rich, round/almost creamy, tongue coating, medium amount of carbonation (even in the 2008). The hoppy bitterness lingers for a long time on the tongue. Somewhat palate wrecking, but in a good way, I guess I really like hops. O: I’m surprised how similar these two vintages are. The 2008 comes across as a little rounder on the tongue and a little more muted in flavor, but neither are small/shy beers, they walk up and punch you in the mouth. One conclusion from tonight, I’m done keeping multiple vintages of Bigfoot. I’ll still going to hold back some each year because it is a different beer after a couple of years, but after a couple of years, there is not enough of a difference to my palate to keep 10 different vintages in the basement. More citrus hops, a little more fruitiness that I think is the hops vs malt or yeast driven. A bit more tingly carbonation on the tongue, seems a little more on the crisp side relative to the older vintages. The easiest way to summarize is to compare 2008 to 2018. The 2018 has much more hop flavor, obvious citrus and pine. While the 2008 is hoppy, it is without the hop flavors, it is mostly just a hoppy bitterness. The lesser hop flavor in the 2008 lets a little bit more of the malt shine through. The difference between 2015 and 2018 ends up being that the 2018 comes across as “fresher”, it is a little bit more “alive” or hoppy/fruity/flavorful. Not necessarily better, just fresher. The 2008 ends up with a little bit more malts, more restrained hops, slightly muted vs fresh. In the end, I’m somewhat amazed at how little difference there is between 2008, 2015, and 2018, maybe the oxygen caps actually do something. I have a 2013 waiting in the fridge, need to find 2019 to compare very fresh to older. Hamilax, BalancingBrooms, ericwo and 9 others like this. After my 2/4 initial plunge with a 2019, which was at my daughter's and son in law's place in Santa Cruz, I decided when I returned to chez Hate to pop one of the 2018s (bottled 12/01/2017) as a basis of comparison. One huge difference: I store mine in a cellar fridge set between 50-55; God knows what the kids fridge is set at but it's a *lot* colder. Maybe because of that the head was much larger and consistent with what photos here have illustrated. Definitely because of the temp differences the smell was more prominent as was the taste. The hops are still very forward and any drop off is indiscernible to my unrefined palate. There's still an underlying sweetness that I hope comes more to the fore with increased age. I'll probably pick up a 2019 sixer tomorrow for cellaring. Bitterbill, TheGent, DIM and 1 other person like this.